"Better than the whipped cream that comes in the squirty canisters! Spread on crepes, fruits, pies or your favorite desserts." Combine the cream, sugar, sour cream and vanilla in a medium bowl. Use an electric mixer to whip to stiff (but not grainy) peaks. Chill until using. Use within one day. 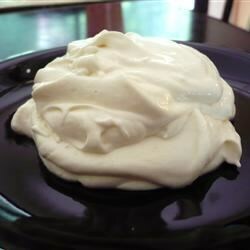 Top your favorite desserts with rich whipped cream. Great stuff! Based on other reviews, I reduced the sour cream to 1/4 cup and increased the heavy cream to 3/4 cup and it is wonderful! Great texture! This one goes in the recipe box. This was so good and very easy. I served this over strawberry shortcake and my husband could not get enough! Be sure to chill the bowl.